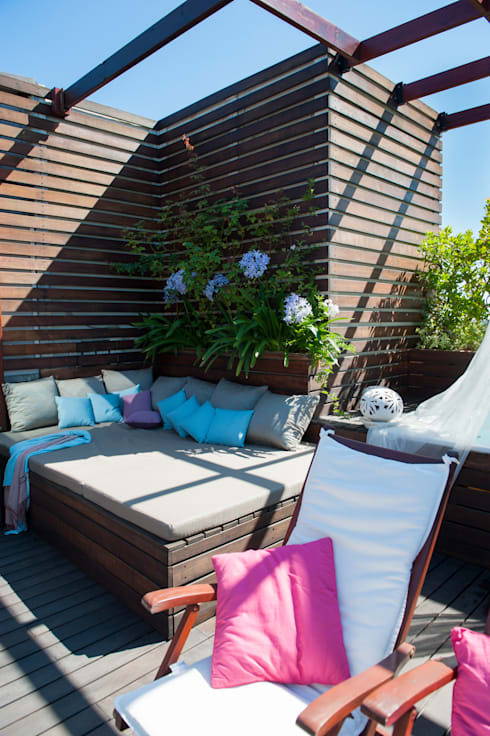 It pays to be smart about arranging your balcony. 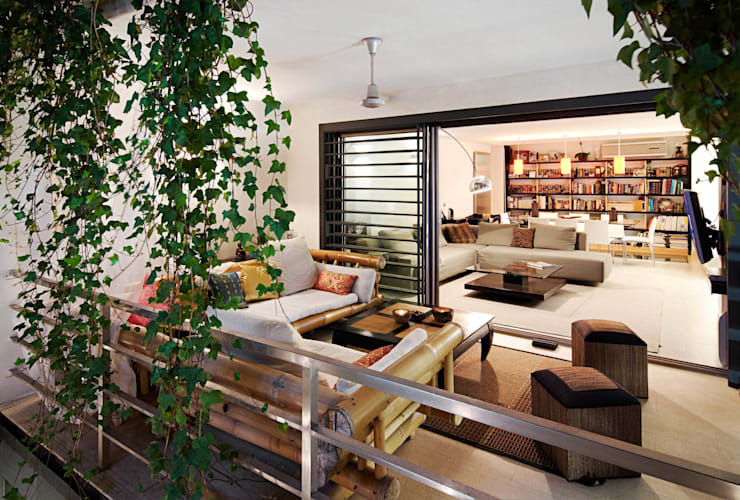 In many large cities like Singapore, a balcony is a precious element in the home. It is an important place to disconnect from the wired world, enjoy a little downtime or just slow down and engage with the natural elements. But how can you best arrange a balcony when the floor space is limited, the balcony has an unusual layout or just a lack of privacy? Perhaps the balcony needs lots of storage or outdoor plants without making it feel small? Whatever the challenges, we have a balcony layout that is sure to work for you. So let's get on with exploring 9 ways to arrange your small balcony. Enjoy! This large balcony has been arranged with an L-shaped outdoor lounge set up to face the interior of the home. It also has some great hanging plants. This kind of set-up is great for those who want extra privacy. 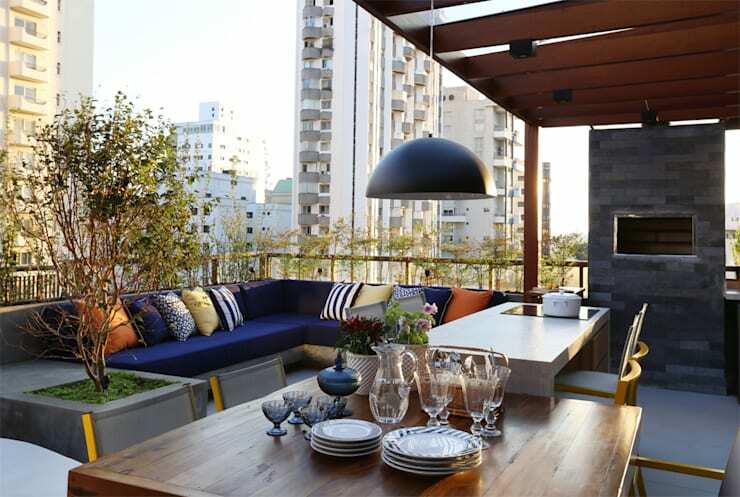 Green elements are a must-have feature in any balcony, but some people worry about getting their seating areas messy. This little balcony has the perfect little separation of space; garden on one side, seating on the other. 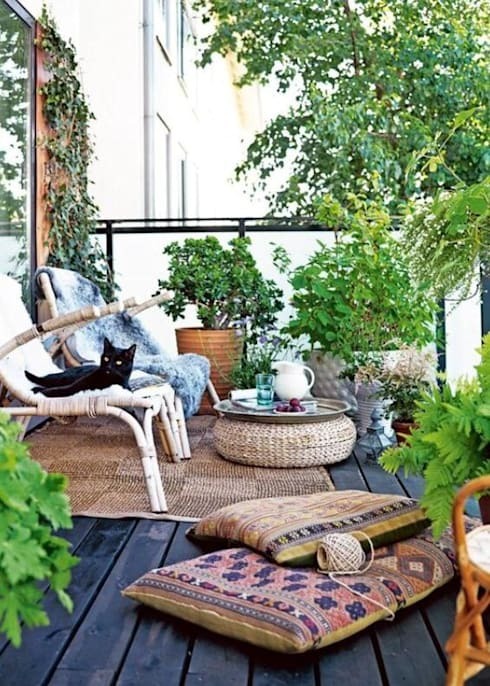 Nothing quite makes a balcony feel relaxing like a casual, bohemian-style arrangement. This one has minimal low-set furnishings, lots of big plants and some casual cushions. It looks like the perfect place to sprawl around on a Sunday! 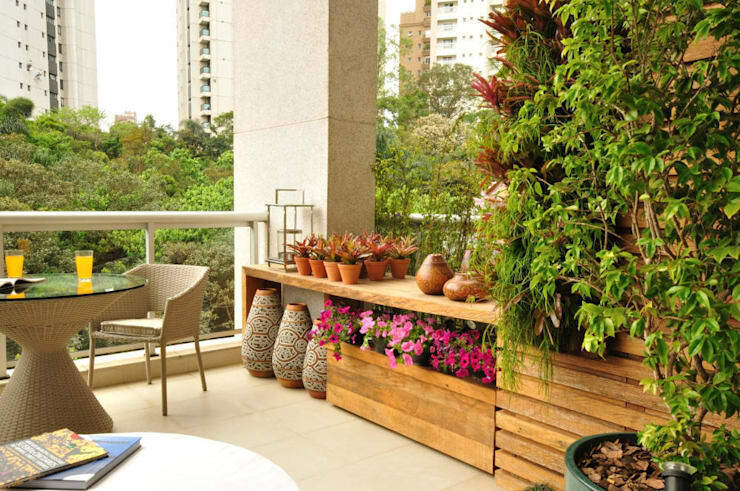 This balcony arrangement has been kept perfectly sophisticated with a wall garden. It frees up the floor space and gives this balcony a whole lot of privacy. When it comes to small balconies, there may not seem like there are many options for arranging the space. But here we can see how well one can be arranged with a round table, bench style seating and awesome balcony accessories that hang from the railings. This large bench-style seating looks like a great place to have a nap in the sun. It fits snugly in the corner and could possibly contain under-seating storage as well. If you have lots of space, a simple wraparound bench can be a good approach. This looks very inviting and is perfect for entertaining large groups. 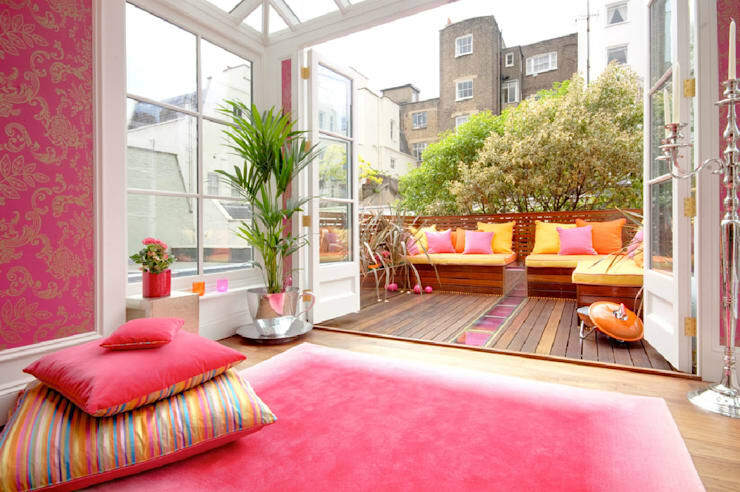 The bright pink and yellow colour furnishings also makes the balcony feel like a natural extension of the living room. 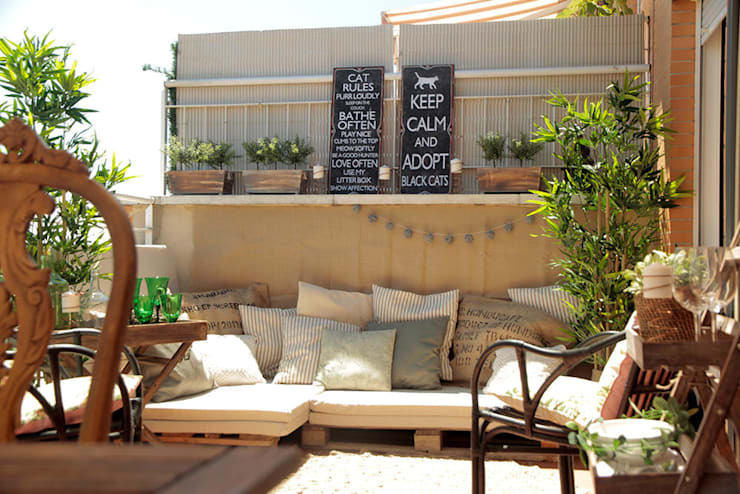 A very low-set outdoor seating area like this will make the balcony feel relaxed and outdoorsy. It will also free up wall space so it can be used as a vertical garden or extra storage space. An outdoor barbecue is all about mixing up socialising and cooking, so it really helps to set up the cooking area so it faces the guests like this. The built-in furniture also makes the most of every inch of space and avoids cluttering up the walkways with free-standing furniture. 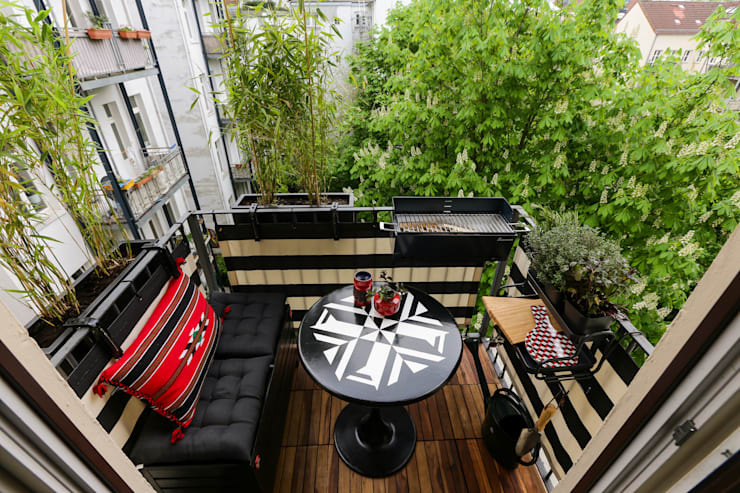 For more inspiration, check out the renovation of a tiny balcony—it's just 8m2! 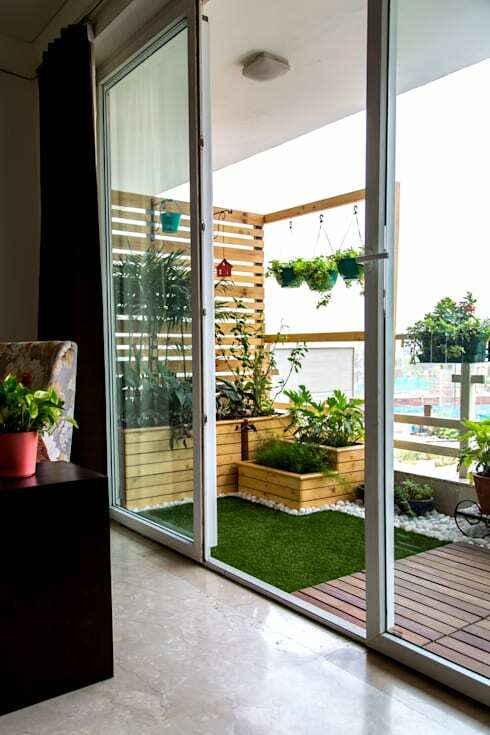 If you have any more tips on arranging a balcony, let us know in the comments field below!